The Commission has just forwarded the first of two required reports on the milk market situation and the prospects for a smooth phasing-out of the milk quota system. The next one is due at the end of 2012. The report concludes that a “soft landing” is on track in an overwhelming majority of Member States. Milk quota prices have a very low value, already at zero in some Member States, and decreasing in most of the others with a view to reach zero in 2015. Milk quotas have ceased to work as a production limit in most Member States, especially in the new Member States, and market orientation is already the leading principle in a number of them. It concludes that under these circumstances there is no reason to revisit the Health Check decisions with regard to the gradual increase in quotas and the end of the quota regime on 1 April 2015. The report will be welcome news for dairy farmers. It also pulls the rug from under those dairy farmers grouped in the European Milk Board who have been arguing that the continuation of supply controls in order to flexibly adjust milk volumes to demand is the basic requirement for cost-covering milk prices (of course, reducing milk quotas even below the pre-Health Check limits would push up domestic EU prices to some extent, but their fear that removing quotas would lead to a sharp fall in milk prices now appears groundless). Mind you, these fears were based on sound economic analysis commissioned by DG Agri, which showed that the removal of quotas would lead to both increased production and decreased prices. It now appears this is unlikely to happen. Two factors have overturned these predictions. The first is the growing linkage between EU and world market prices in recent years, making EU market management tools redundant. The second is the disappearance of quota rents in most Member States. 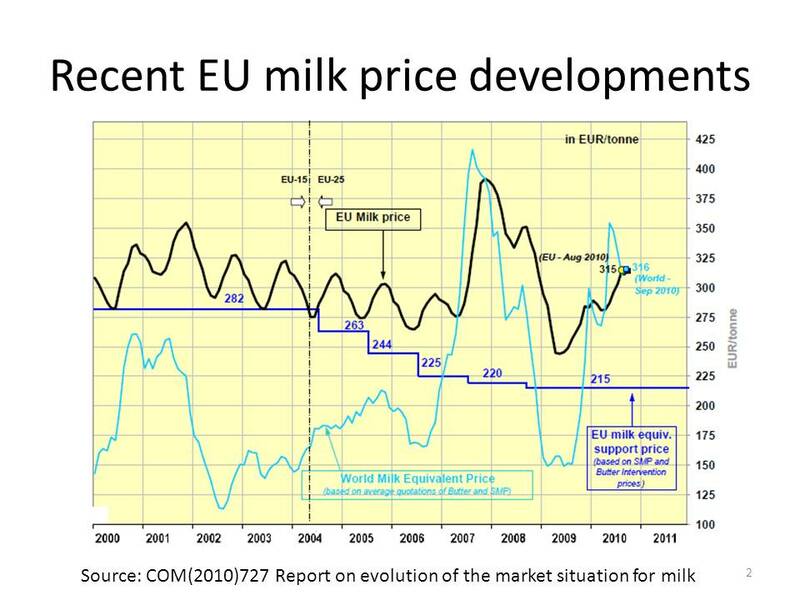 The graph below shows recent developments in EU milk prices in relation to global prices, measured as the world milk equivalent price. The steep climb to record prices at the end of 2007, driven by world market prices, is evident, as is the equally steep fall in prices through 2008 and into early 2009. EU prices began to recover since then, again driven by world market developments. EU market management instruments, including export subsidies (set at zero since the end of 2009) and tariffs, are now ineffecctive in influencing the milk price EU dairy farmers receive. However, more important is that milk quotas are gradually becoming less relevant, as milk production falls short of quota in an increasing number of Member States. While surplus levy had to be paid by 6 Member States in quota year 2008/09, only 3 are on course to pay one in quota year 2009/10. 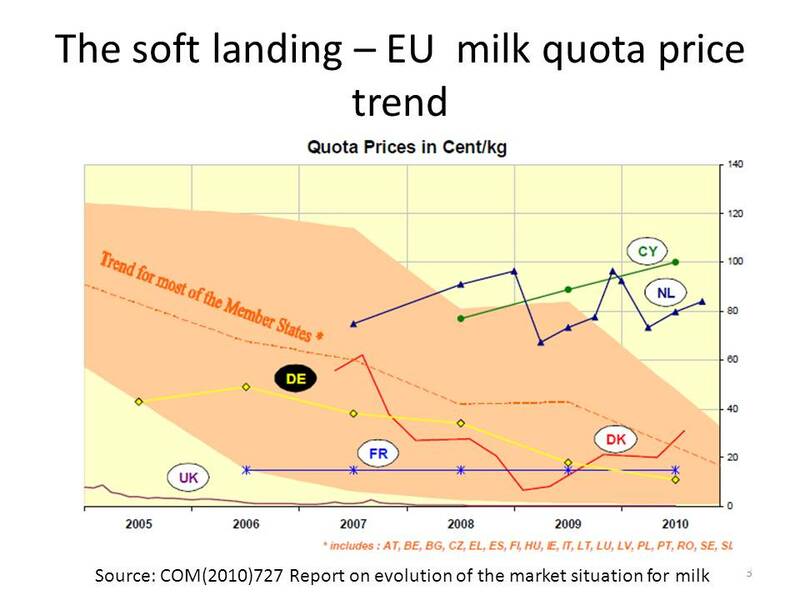 According to official notifications by Member States, the 2009/10 quota year is estimated to have ended with EU milk deliveries approximately 7% under quota. 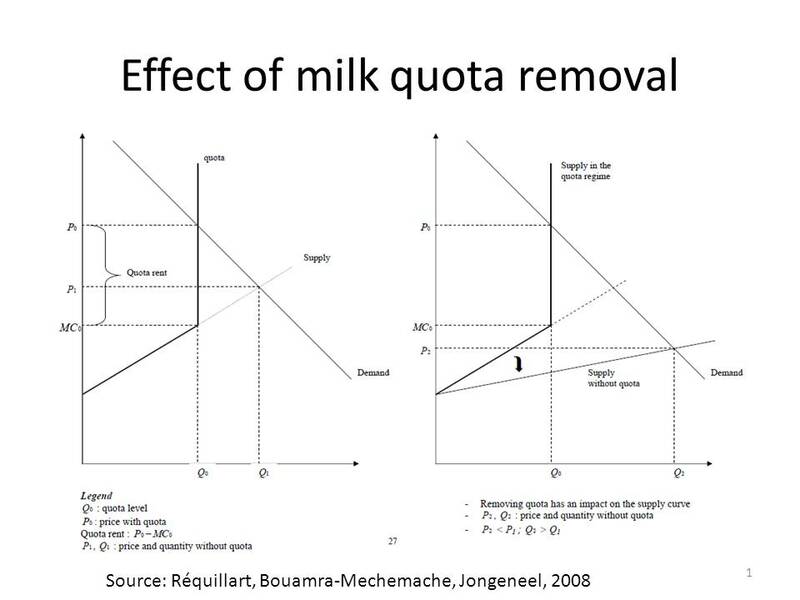 All of the previous economic analyses of the removal of milk quotas assumed that quotas constrained production at farm level, indicating that marginal costs of production of the quota volume were much less than the producer price received. The difference between the price under quota (higher than market price when quotas are binding) and marginal costs of production is defined as the quota rent. Because the existence of quota rents shows that marginal costs of production are below the producer price, the removal of the quota was assumed both to lead to lower prices but also increased production. The economic analysis is shown in the diagram below. The left panel shows how producers, limited by the operation of the quota, will take advantage of its removal to increase production. Indeed, because the quota leads to rigidities in production by creating additional costs for the expansion of efficient producers, its removal would also be expected to lead to farm restructuring, and thus a downward shift in the supply curve, thus giving a further boost to production and an even lower price (shown in the right-hand panel). The Commission report shows that quota rents are now being eroded, so a surge in production leading to a fall in prices when quotas are abolished in 2015 does not appear likely. 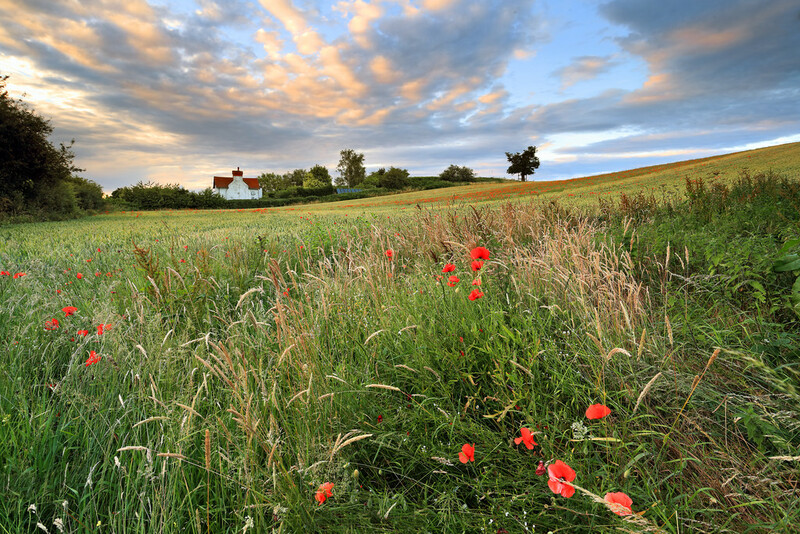 The Commission’s report may be too optimistic. Dairy farmers in 2009/10 may still have been overly influenced by their bad experiences in 2008/09 to bet on a future in dairying. Nor does the disappearance of quota rents necessarily mean that dairy farmer incomes are satisfactory. Quota rents could be zero because of high input costs or because of poor expectations for future milk prices. However, the evidence suggests that the EU milk market is now close to a market equilibrium, and this can only be good news for those working in the industry. Next PostNext Biofuels: is the game up?